Pinfire opals: The opal on the left is a pinfire opal cut from material mined at Coober Pedy, Australia. The stone on the right is a pinfire opal from the Constellation Mine in Spencer, Idaho. It is 6 millimeters by 4 millimeters in size. What is a Pinfire Opal? "Pinfire opal" is a name used for opal that has pinpoints of fire throughout the stone. 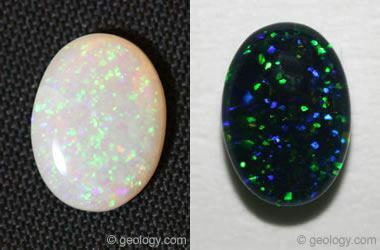 The opal on the left is a pinfire opal cut from material mined at Coober Pedy, Australia. The stone on the right is a pinfire opal from the Constellation Mine in Spencer, Idaho. It is 6 millimeters by 4 millimeters in size. The video below illustrates the "play-of-color" in a pinfire opal.